Copyright © 2013 Angelo Troedhan et al. This is an open access article distributed under the Creative Commons Attribution License, which permits unrestricted use, distribution, and reproduction in any medium, provided the original work is properly cited. Implant insertion is an alternative to classical treatment with bridges after tooth extraction or traumatic tooth loss in the anterior and premolar region of the upper and lower jaw. Nevertheless both types of prosthetic treatment inhere major gingival aesthetic pitfalls by physiological vertical and horizontal resorption. 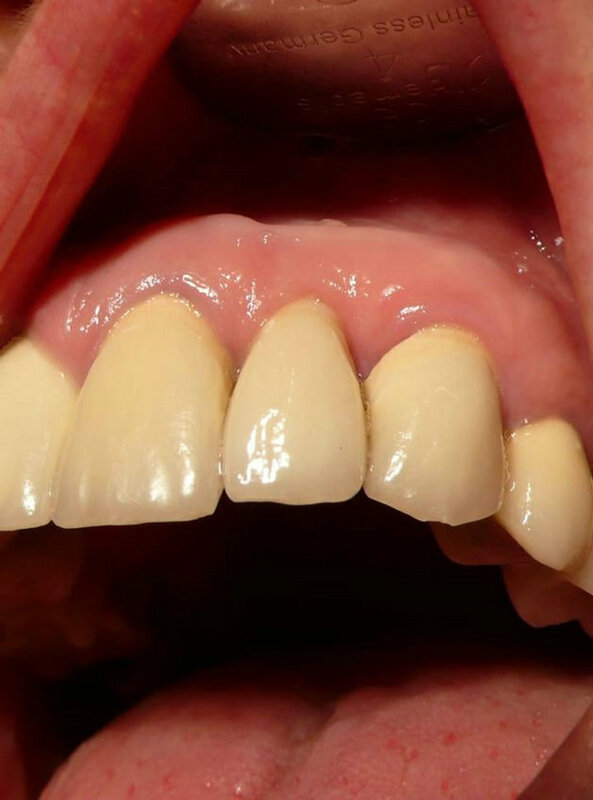 Aim of the study was to investigate if the immediate insertion of root analogue single-stage implants and prosthetic treatment could prevent gingival recessions and bone resorption thus keeping the natural gingival aesthetics untouched. 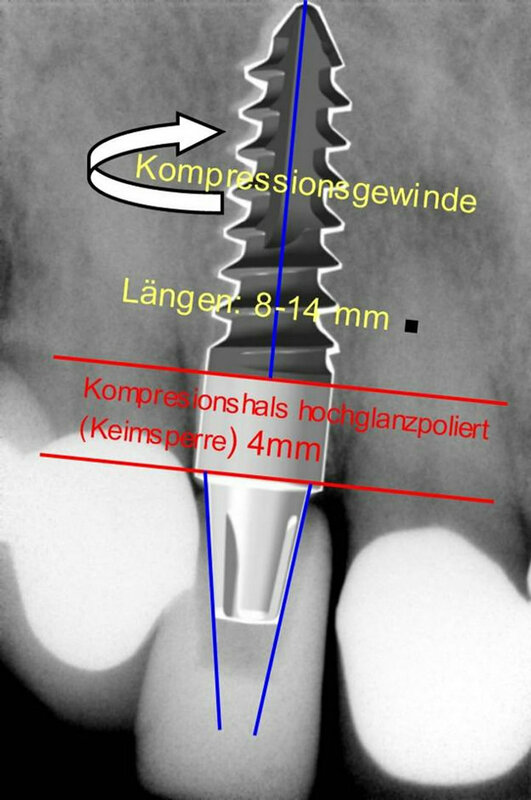 Between 2003 and 2006, 348 root analogue Q1-Implants (TRINON Karlsruhe GmbH/Germany) were inserted in 342 patients’s premolar and molar regions immediately after tooth extraction or traumatic tooth loss and treated with provisional resin crowns. The observation period with recurring 6-month clinical and radiographic check-ups was a minimum of 5 years. Of 348 inserted implants 4 (1.15%) were lost resulting in an overall success rate of 98.85%. In the first 12 weeks after surgery a mean recession of the buccal gingival margin of 0.2 mm (SD 0.34) could be detected, after final prosthetic treatment an overall mean recession of 0.2 mm (SD 0.13) within the survey period. Immediate implant insertion of root analogue single stage implants and immediate prosthetic treatment with provisional resin crowns after minimal invasive tooth extraction seems to be appropriate to prevent bone resorptions of the buccal alveolar crest and the recessions of the gingiva and papillae and thus suggests to be the preferable treatment to keep the natural gingival and papillary aesthetics untouched preventing further traumatic surgical gingival reconstructions. Due to the increasing acceptance and demand by patients for tooth implants as an alternative to bridges after tooth loss, a predictable treatment and long-term cosmetic aspects are the main focus in the area of anterior teeth and premolars. 4) Periodontal resorption caused by periodontitis (generic, hygienic deficits, imperfect dentin-crown margins of inserted crowns). Patients having lost anterior and/or premolar teeth caused by 1 to 3 could still be treated with bridges but prosthetical treatment-indication shifts more and more towards implant-insertion, particularly in cases when adjacent teeth fail as potential bridge posts because they are either fully intact (no fillings) or already prosthetically treated with crowns or already serve as bridge posts for inserted bridges. 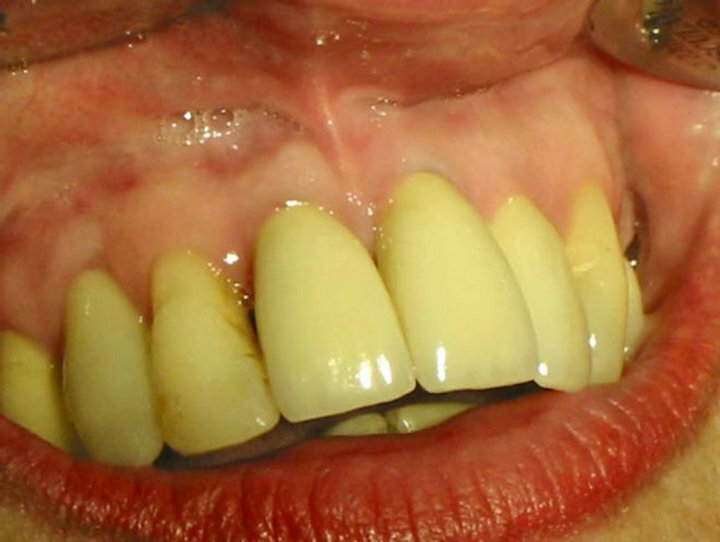 Tooth loss caused by 4) must be carefully considered whether the patient is verifiably willing to observe the hygienic requirements correctly or whether a prosthetic implant can meet the cosmetic requirements with regard to the gingival soft tissues especially in the anterior maxillary region (“pink aesthetics”). Both treatment alternatives—bridges and implants— are critical from the physiological point of view regarding the preservation of the individual hard and soft tissues of the alveolar ridge and by this the preservation of the individual natural gingival aesthetic at the tooth-loss site . After traumatic tooth loss (without fracture-related loss of the buccal alveolar ridge lamella or the entire alveolar ridge) and surgical tooth removal (without iatrogenic bone defects) a centripetal reduction of the alveolar crest both in width (narrowing) and height will inevitably occur in the course of bone-healing of the alveola which can be compensated only partly by augmentational procedures known as “socket preservation” . These physiological procedural resorptions of hard tissues followed by gingival recessions often lead to difficulties in the recovery of the patient-specific gingival and papillary aesthetics in the course of prosthetic treatment and might lead to the necessity of highly demanding and traumatic gingival aesthetic surgery with not always fully satisfactory results [3,4] or lately the gingival and papillary application of hyaluronic acid to improve the cosmetic results  with limited applicability. 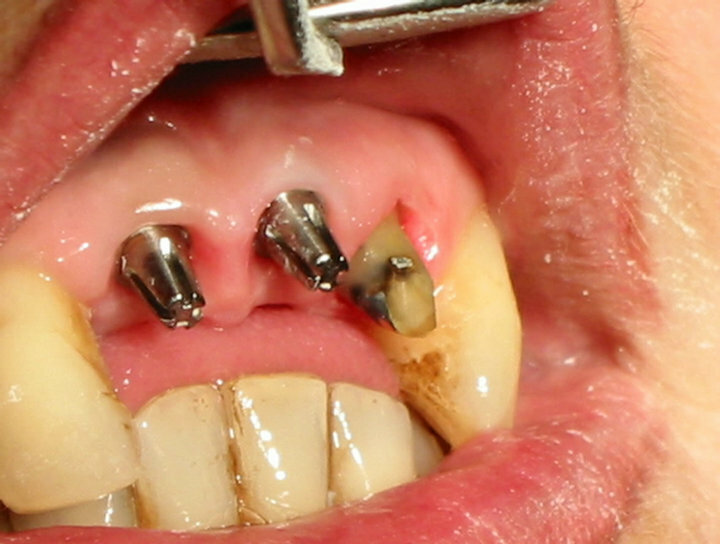 Cases being treated merely by bridge prosthetics carry the risk of unmanageable gap-development between the pontic/pontics and the gingiva and/or gingival papilla recessions with exposure of the crown margins towards the pontic site immediately when the prosthetic treatment has been carried out too early (mostly before the end of the 3rd month after tooth loss), in the long term by centripetal and vertical atrophy of the toothless alveolar ridge site below the pontic/pontics [6-11]. A delayed implant insertion or the use of two-stage implants might lead to similar resorptive effects with adverse effects regarding gingival aesthetics demanding secondary complex mucogingival surgery [3,4]. These techniques (mucogingival shiftor rotation-flaps, free connective tissue transplants etc.) require routine and a high grade of surgical skills and inhere another risk of medical and/or esthetical complications. Aim of this prospective study was to verify whether immediate implant-insertion of single-stage implants after tooth loss (traumatic/extraction) in the anterior and premolar region could be suitable to prevent aesthetic deficits of the gingival margins and papillae short and long term and to quantify the success rate over 5 years. 4) Approximal plaque index in the area of premolars and anterior teeth of max. 40% (corresponding to the average individual oral hygiene indices in the population). Patients with acute or chronic periodontitis of single teeth with loosening degree 2 and 3 and periodontal alveolar ridge defects of more than 1/3 of the root length or generalised periodontitis were excluded. The single-stage and root-analogue Q1-implant system (Trinon Karlsruhe GmbH/Germany) was chosen as implant system for this study. Figure 1. 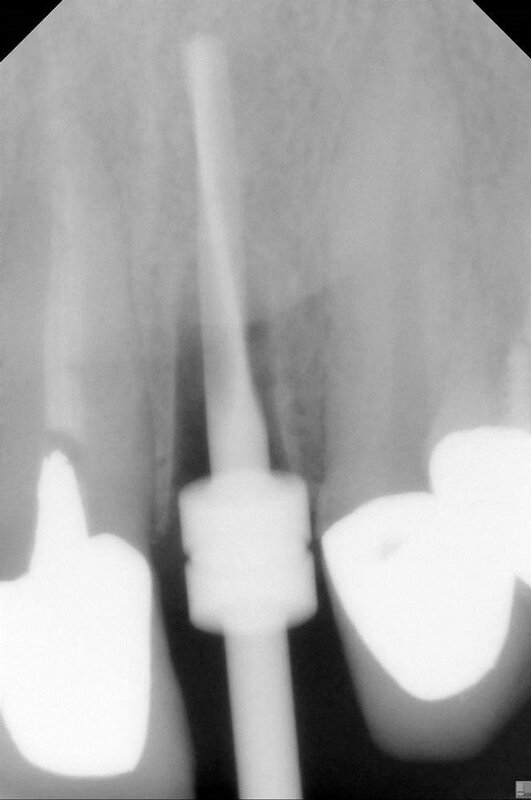 Q1 root-analogue implants. design with progressive bone-compacting effects for sufficient primary stability. It allows intrasurgical flexibility regarding a variable insertion depth independent from prior implant bed preparation and correction of the insertion angle (Figure 2). 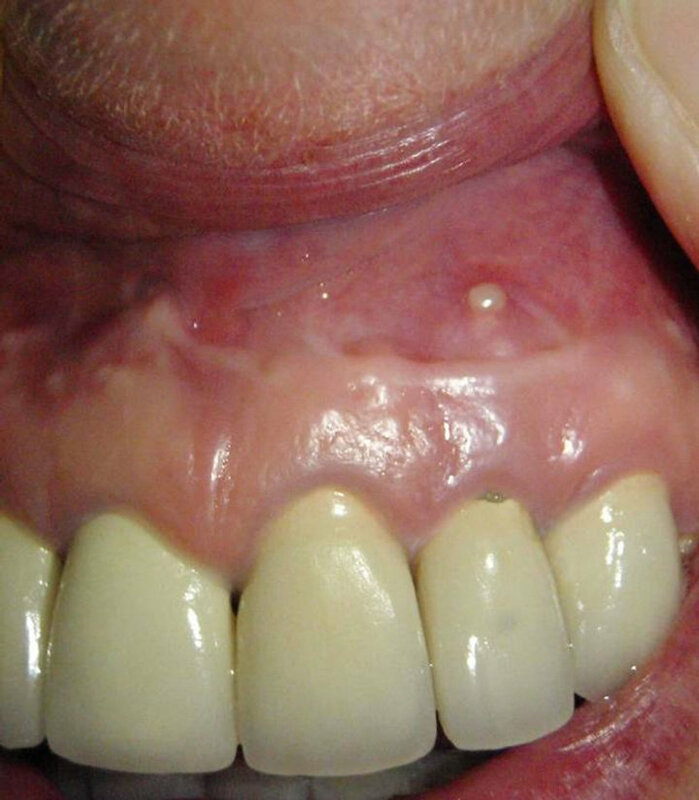 d) the gingiva, gingival margin and papillae needed to be intact and free of inflammation (Figures 3 and 4). Figure 2. 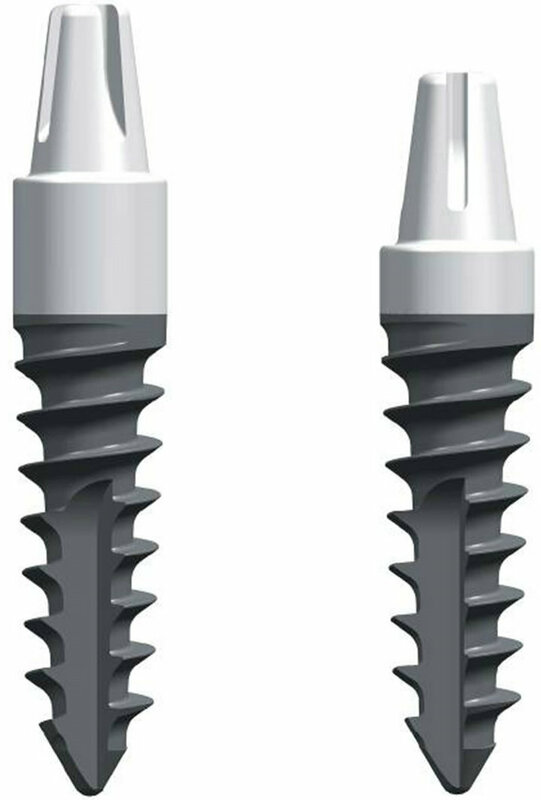 Q1-implants allow variable insertion-depths and angles at final insertion and can be inserted up to 4 mm deeper and corrected by angle up to 7˚ than prior drilling preparation and thus be precisely adapted to the gingival margin and the alveola at final insertion. Figure 3. 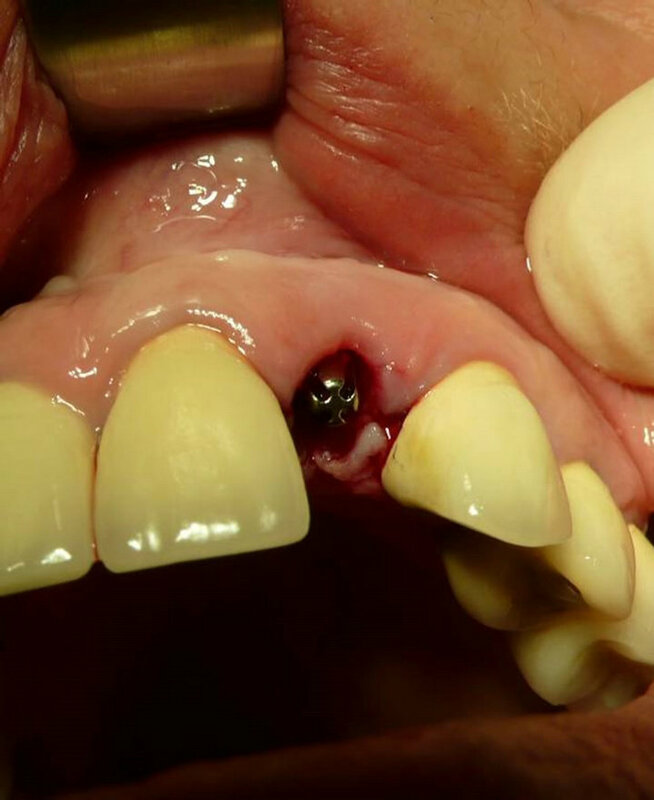 Case 1: Recurrence of an apical granuloma of the second left incisor with a chronic fistula after two apisectomies. 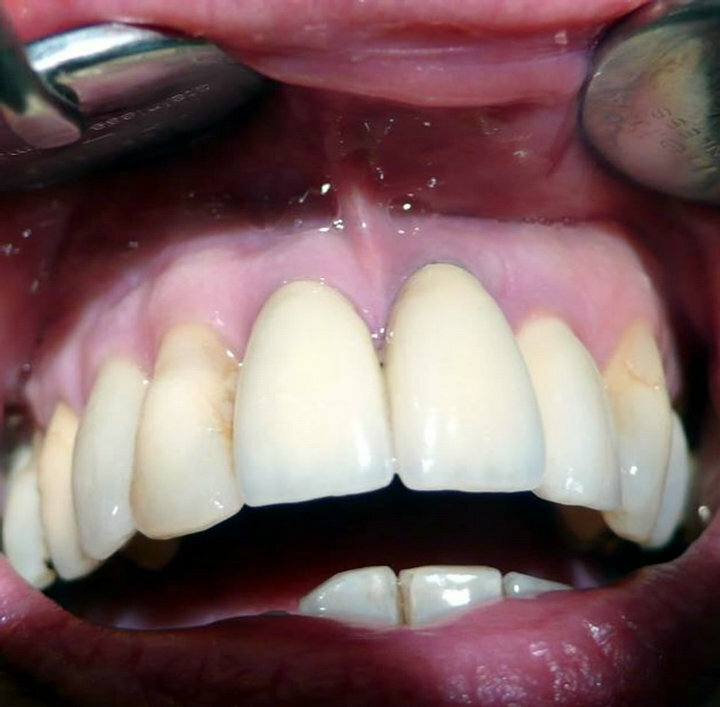 Adjacent gingiva and papillae are free of inflammation, adjacent teeth are treated with intact metalloceramic crowns. Figure 4. Case 1: Corresponding radiograph. Apical granuloma recurrence marked with a red arrow. Figure 5. Case 1: Extraction site. Figure 6. Case 1: Removed root ready for measurement of axial length. 8) Fabrication and insertion of an individually shaped and for the emergence profile anatomically correctly designed resin provisional crown based on the prefabricated snap-on Q-caps (Figure 10) after surgery as “wound closure”. Fixation of the provisional with temporary cement and adaptive sutures was prohibited in order to prevent additional traumatization of the gingival seam and not to change the natural gingival emergence profile iatrogenically (Figure 11). All patients were shielded after surgery for a period of 4 to 5 days with Clindamycin 300 mg 3 × 1/day or Amoxicillin/Clavulic Acid 1 g 2 × 1/day and interviewed 7 days after surgery about pain and swelling. 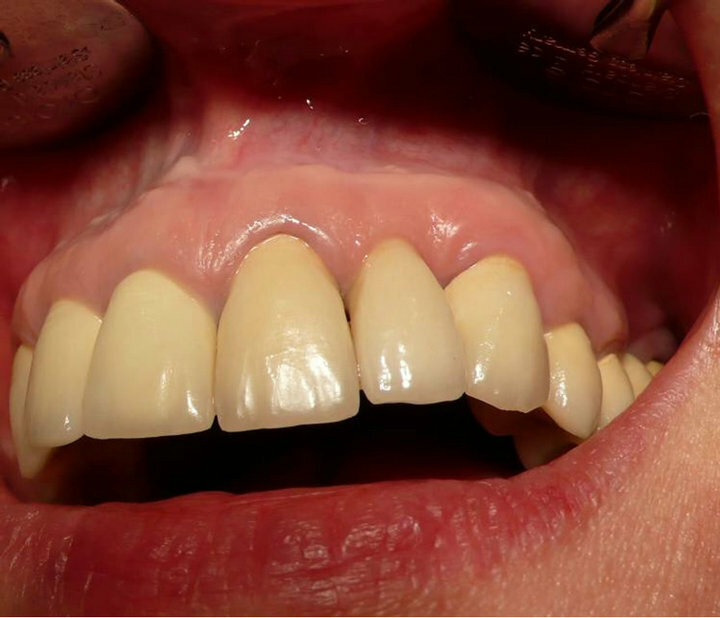 The final prosthetic treatment with ceramometallic or ZiO-crowns was carried out 3 to 4 months after surgery (Figure 12). Patients were advised and trained by a dental hygienist to apply thoroughly tooth brushing by the “red-white”—technique with soft tooth—brushes and to strictly avoid horizontal tooth brushing. Figure 7. Case 1: Intrasurgical X-ray with pilot-drill in site. Figure 8. 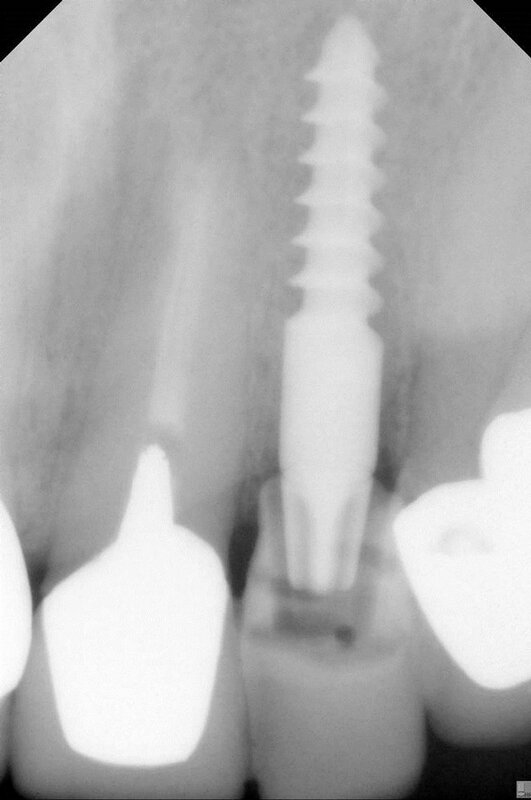 Case 1: Post-surgical X-ray with Q1-implant (Diameter 3.5 mm, screw-length: 12 mm, gingival neck: 4 mm) and anatomical correct full functional provisional resin crown in site. Figure 9. 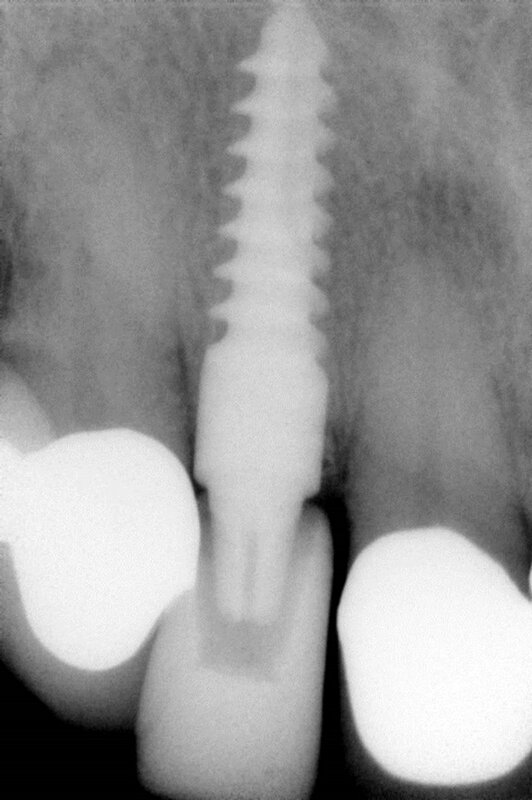 Case 1: Implant site immediately after surgery. Figure 10. Q-Cap as base for fabrication of a full functional provisional resin crown. Figure 11. Case 1: Fully functional anatomically correct provisional resin crown clipped onto implant and stabilized with flow-composite to the adjacent crowns. Provisional is not cemented to prevent additional traumatization of the gingival margin and papillae at cement removal. Figure 12. Case 1: Final ceramometallic crown in site. 6) Survey of the individual patients’ satisfaction grade (patient’s statements during the control examinations in the categories: very satisfied, satisfied, need to be improved, poor). Gingival recessions were assessed statistically by mean value and Standard Deviation. Crestal resorptions were not assessed statistically due to lack of reproductible positioning of the digital X-Ray sensor and/or unreliable periodontal probing in split-millimeter scale. A total of 362 out of 403 inspected patients (89.83%) complied with the general eligibility-protocol as defined. Of the 362 patients eligible 19 patients decided against implant treatment (5.25%), one patient (0.28%) had to be excluded due to an apical cyst with a larger diameter than the implant body. c) “Fear of allergy against implants/biological incompatibility”: 2 patients (10.53%). In total 348 Q1-implants were inserted in 342 patients. 4 patients (1.17%) were treated with implants and provisional prosthetics as emergency cases within 8 hours after anterior tooth loss due to trauma. From a total of 348 inserted implants 4 implants in 3 patients were lost within the observation-period (loss rate: 1.15%): 2 patients suffered from loss of one implant each (Sites: second and first incisior) within the 3-months healing period prior final prosthetic treatment caused by periimplantitis and consecutive loosening in the 8th and 10th week after surgery, one patient lost 2 implants in the maxillary premolar site in the fourth year after surgery caused by peri-implantitis due to a lack in the personal oral hygiene. 93.86% of the patients stated to have been free of any pain and swelling after surgery, 6.14% reported mild pain and subjective swelling until the 4th day after surgery (Table 1). Table 1. Statistical analysis of overall implant loss, implant loss preand postprothetic and pain and swelling occurrance. tact papillary structure within the observation period and beyond. Recessions of the buccal gingival margin of 1mm up to a maximum of 1.8 mm occurred in 5.78% of the cases during the first 8 to 12 weeks after surgery. After insertion of the final crown(s) 3 - 4 months post surgery recessions of a maximum of 0.4 mm could be detected in the observation period of 5 years (Table 2). 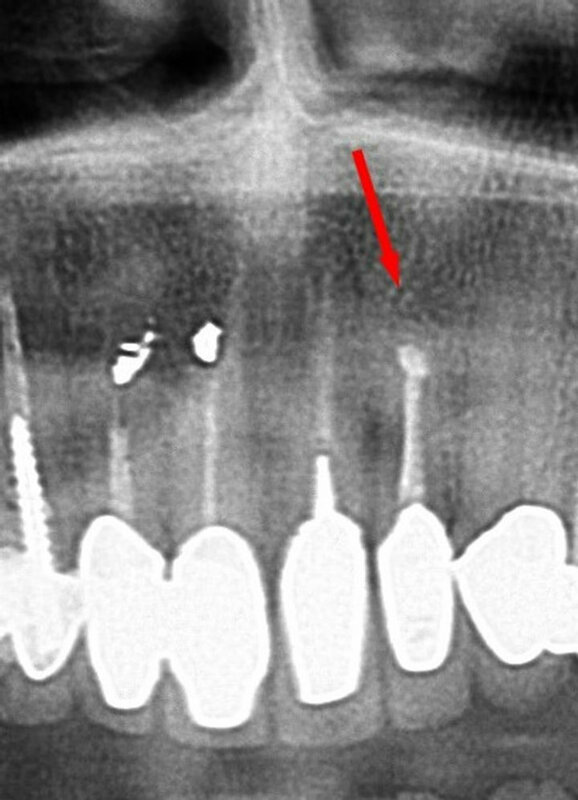 In the radiographic follow-up the periimplant alveolar ridge structure was clinically consistently stable with minor vertical bone losses of a maximum of 1 mm in the observation period although measurement values in radiographs and periodontal probing for technical reasons were not reliable enough for statistical evaluation. Pocket depth probing resulted consistently in values of 1.5 to 2 mm which is the natural biological width and a papillary bleeding index (PBI) of 0 to maximum 1 (Figure 13). In the 5-year observation period there was no case of exposure of the implant-neck caused by gingival or bone recessions. 71% rated the cosmetic result as “very satisfactory” after 5 years post surgery24% as “satisfactory”4% as “need to be improved”, and only 1% as “unsatisfactory”. 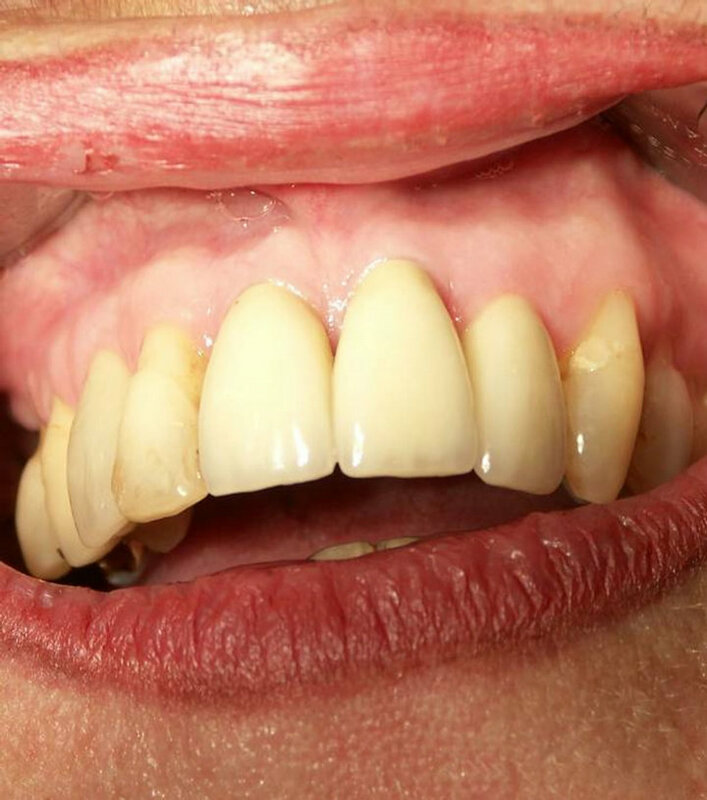 The 4% patient group rating the long term cosmetic result as “needs to be improved”, mainly criticized a light “bluish cast” of the buccal gingiva when exposed to bright artificial light. Table 2. Statistical analysis of gingival recession behaviour before and after final prosthetic treatment. Figure 13. 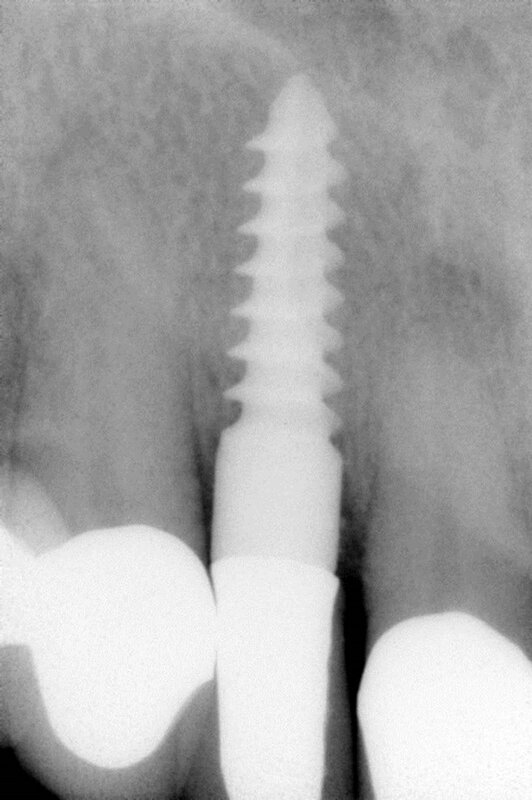 Case 1: Clinical situation after 5.3 yr.
predictable application and which seems to be suitable particularly for this indication due to it’s root analogue compression screw design granting a high primary stability at insertion and physiological masticatory force distribution into the alveolar bone (Figures 13-22). 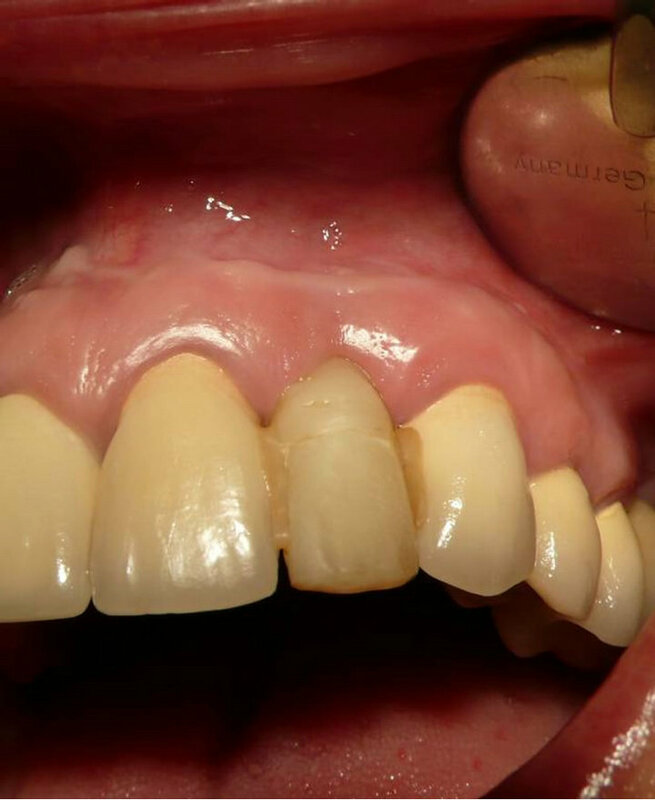 The duration of treatment of 3 - 4 months until the insertion of the final crown is similar to a treatment with bridges provided the healing period after tooth extraction is respected to avoid subpontical gaps and aesthetic compromises such as papillary atrophy (“black triangles”) of the adjacent teeth. 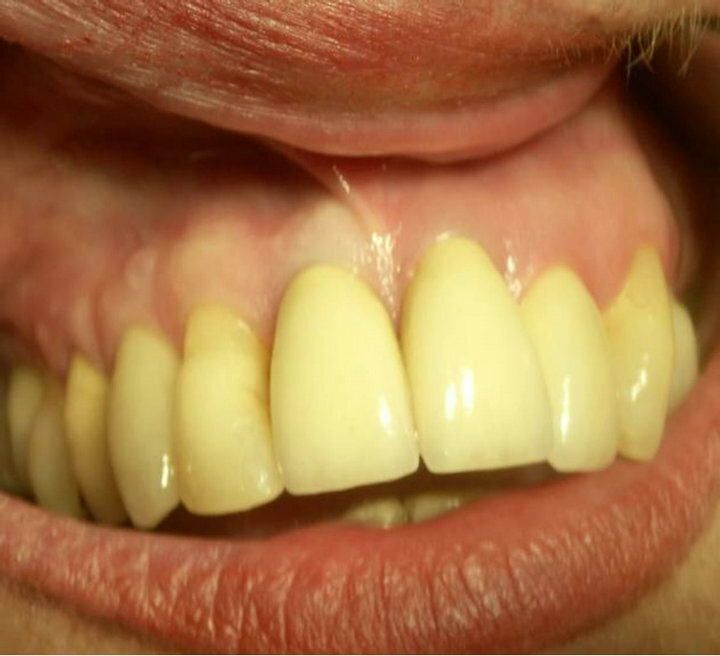 The significant clinical success rate regarding the function and gingival aesthetics is also reflected by the patients’ appreciation of not having to wear any removable dentures during the interim period or to bear the high costs of interim bonding bridges as well as the overall simplicity of the treatment with a full natural aesthetic and functional outcome which some patients described as “if it would be my own natural tooth”. Figure 14. 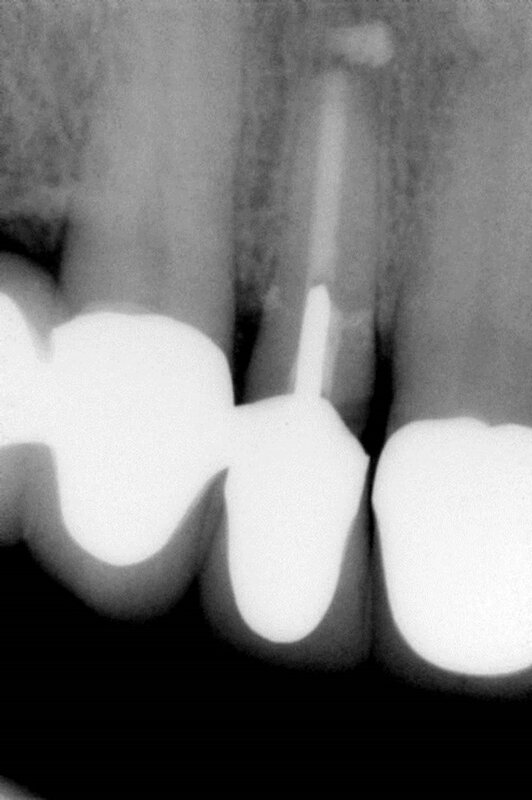 Case 2: Implant insertion after traumatic tooth loss (2003). Figure 15. Case 2: Clinical situation after 1 yr. Figure 16. Case 2: Clinical situation after 3 yr. Figure 17. Case 2: Clinical situation after 5.8 yr. Figure 18. Case 2: Clinical situation after 9.6 yr (recession of the gingiva at the left first incisor starts to reveal the implant neck but generally follows the recession pattern of the natural dentition). Figure 19. Case 3: Presurgical situation: horizontal root fracture of right 2nd incisor, neighbouring teeth act as posts for bridges. Figure 20. 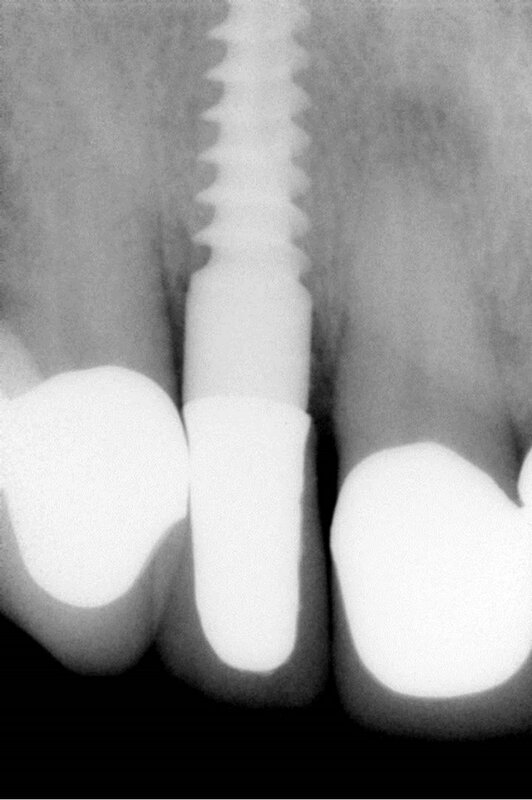 Case 3: Post surgical X-ray with implant and provisional resin crown in site. Figure 21. Case 3: Final prosthetic treatment after 3.5 months. Figure 22. Case 3: X-ray 5.6 yr after treatment: No significant crestal bone resorptions can be detected. It could not be verified whether the slight postsurgical pain which was stated by 6% of the patients resulted from the application of the local anaesthetic, the extractionprocedure or implant placement. However even for this patient group the endured pain was within the subjectively expected range. Since the minimal invasive procedure of tooth extraction and simultaneous insertion of a single-stage root-analogue implant can be applied in 90% of the cases conservative therapy with bridges can be considered as “therapy of second choice” in the future. No cosmetic compromises and/or complex and complication-bearing secondary soft tissue reconstructions need to be carried out when the described implant therapy is applied. In summary the authors therefore conclude that the immediate implant-insertion after tooth extraction with a root-analogue single stage implant in the area of anterior teeth and premolars with immediate loading by an anatomically correct provisional crown is the therapy of choice for the preservation of the bony alveolar ridge structures and gingival aesthetics when complied with the indication criteria. The treatment process is efficient, cost effective and burdens patients as little as possible. Roccuzzo, M., Bunino, M., Needleman, I. and Sanz, M. (2002) Periodontal plastic surgery for treatment of localized gingival recessions: A systematic review. Journal of Clinical Periodontology, 3, 178-194. Schropp, L., Wenzel, A., Kostopoulos, L. and Karring, T. (2003) Bone healing and soft tissue contour changes following single-tooth extraction: A clinical and radiographic 12-month prospective study. The International Journal of Periodontics and Restorative Dentistry, 23, 313- 323. Denissen, H.W., Kalk, W., Veldhuis, H.A. and van Waas, M.A. (1993) Anatomic considerations for preventive implantation. The International Journal of Oral & Maxillofacial Implants, 8, 191-196. Schropp, L., Kostopoulos, L. and Wenzel, A. (2003) Bone healing following immediate versus delayed placement of titanium implants into extraction sockets—A prospective clinical study. The International Journal of Oral & Maxillofacial Implants, 18, 189-199. Kalk, W., Denissen, H.W. and Käyser, A.F. (1993) Preventive goals in oral implantology. International Journal of Dentistry, 43, 483-491. Wheeler, S.L., Vogel, R.E. and Casellini, R. (2000) Tissue preservation and maintenance of optimum esthetics: A clinical report. The International Journal of Oral & Maxillofacial Implants, 15, 265-271. 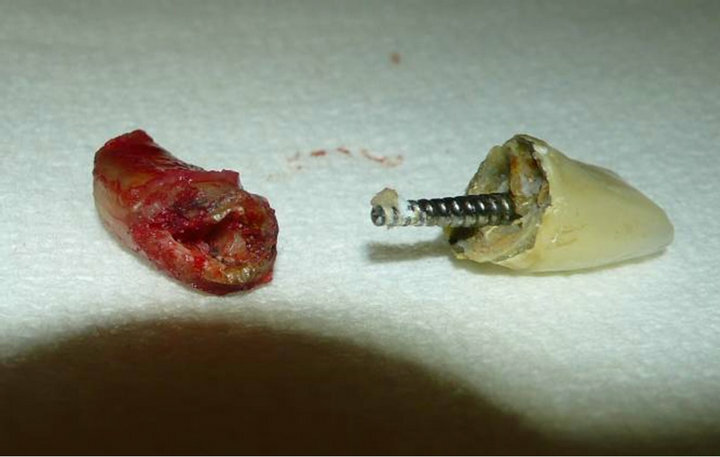 Quirynen, M., Van Assche, N., Botticelli, D. and Berglundh, T. (2007) How does the timing of implant placement to extraction affect outcome? The International Journal of Oral & Maxillofacial Implants, 22, 203-223. Kan, J.Y.K. and Rungcharassaeng, K. (2003) Interimplant papilla preservation in the esthetic zone: A report of six consecutive cases. The International Journal of Periodontics and Restorative Dentistry, 23, 249-259. Kois, J.C. (2001) Predictable single tooth periimplant esthetics: Five diagnostic keys. Compendium of Continuing Education in Dentistry, 22, 199-208. 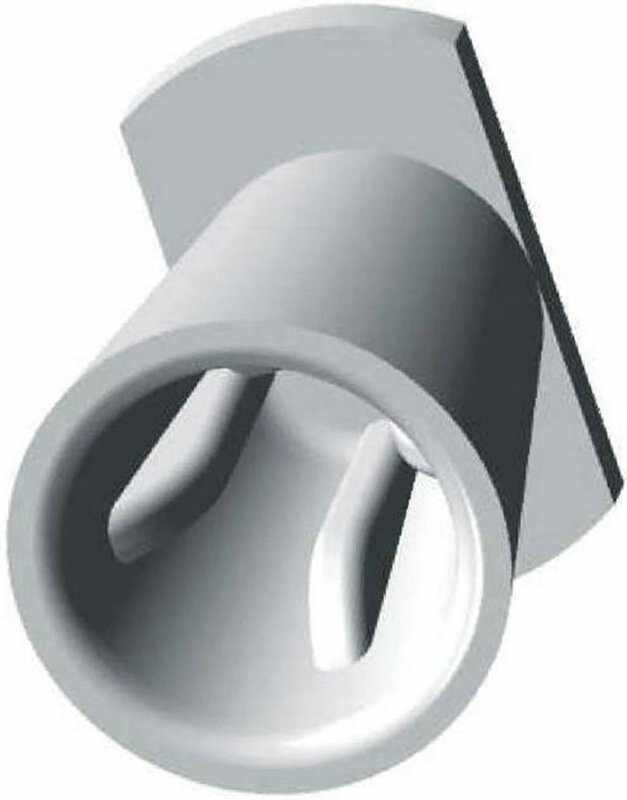 Kan, J.Y.K., Rungcharassaeng, K. and Lozada, L. (2003) Immediate placement and provisionalization of maxillary anterior single implants: 1-year prospective study. The International Journal of Oral & Maxillofacial Implants, 18, 31-39. Spear, F.M. (1999) Maintenance of the interdental papilla following anterior tooth-removal. Practical Periodontics and Aesthetic Dentistry, 11, 21-28. Garber, D.A., Salama, M.A. and Salama, H. (2001) Immediate total tooth replacement. Compendium of Continuing Education in Dentistry, 22, 210-218.